Winter flowers are often spectacular, unusual or scented to lure the few pollinating insects that are around. I like to see them near my house or along a path where they give a great boost on a winter’s day. 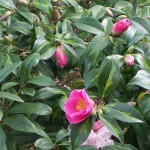 Look out for lovely winter flowers in parks and give them a sniff, you’ll be surprised how gorgeous some of them smell. Here are a few winter charmers you may enjoy and the good news is they are all low maintenance. Delightful crowns of scented yellow flowers appear in late autumn and persist through winter. The flowers are tiny on long racemes at the top of the architectural evergreen spiny foliage. I have seen bees visiting mine. It likes a shady spot. 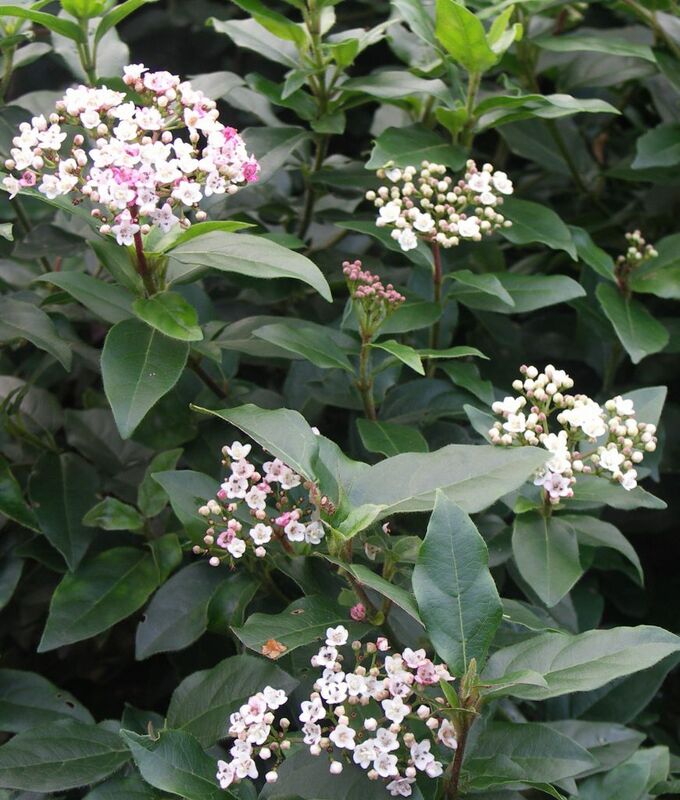 White posies of sweetly scented flowers emerge from pink buds to decorate this dark-leaved evergreen shrub over a long period in winter. Blue-black berries follow-on. 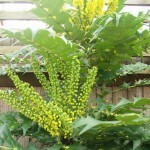 It makes a large shrub in sun or part shade and can be pruned to make a hedge or clipped ball. 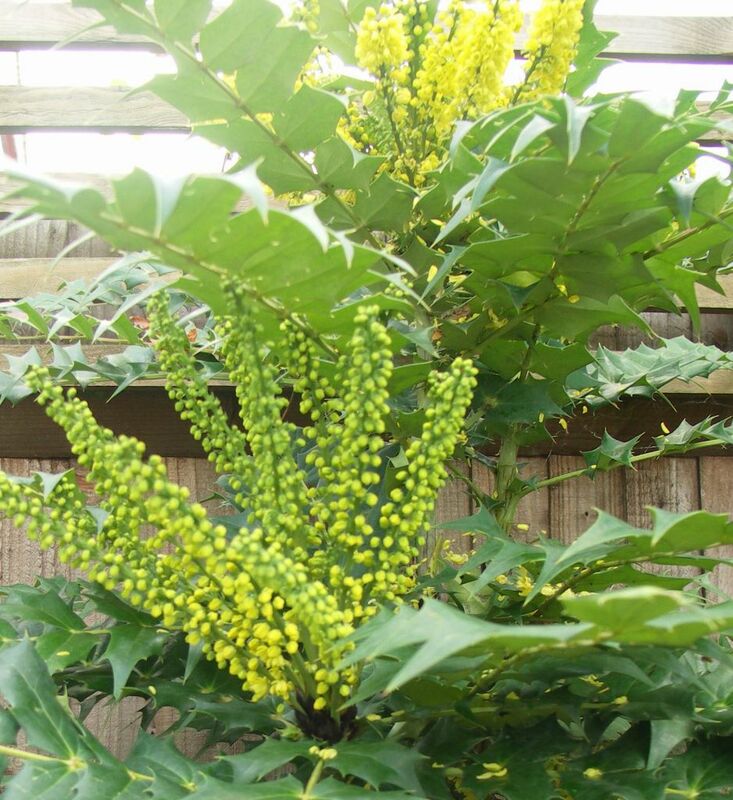 This is a lovely upright shrub with golden markings in the centre of glossy deep green leaves. 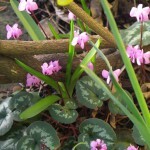 The buds form early and the rich pink single flowers can last from late January to early April. 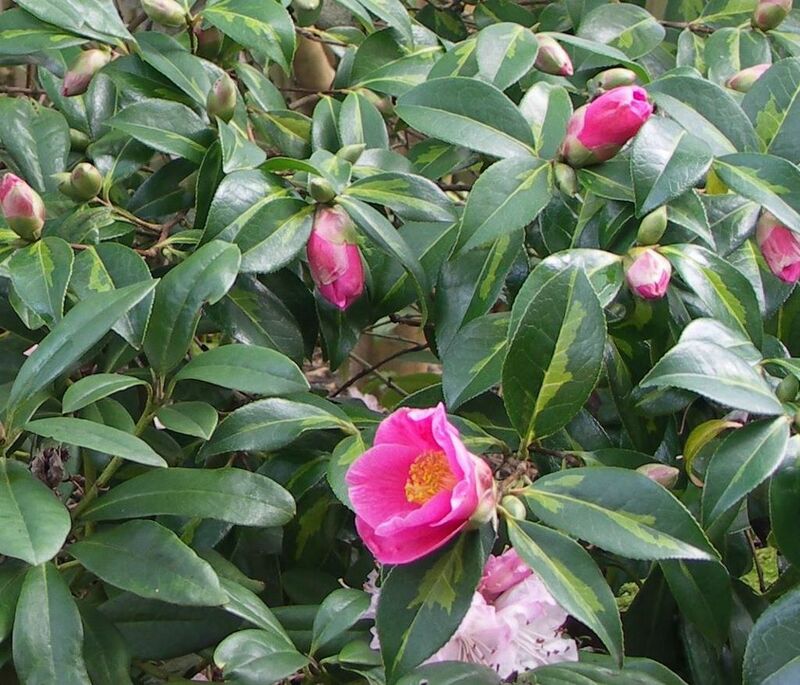 Unlike some camellias, it is not ‘blousy’ and its variegated foliage is interesting all year. 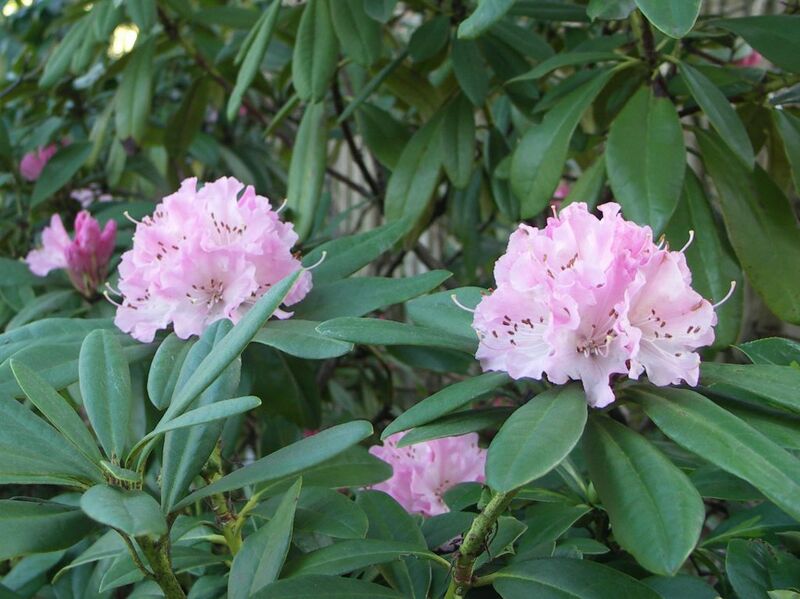 Put in a shady place with slightly acid soil but not east facing as frost and morning sun can damage the blooms. These gorgeous soft pink heads of flowers are just what we need soon after Christmas. 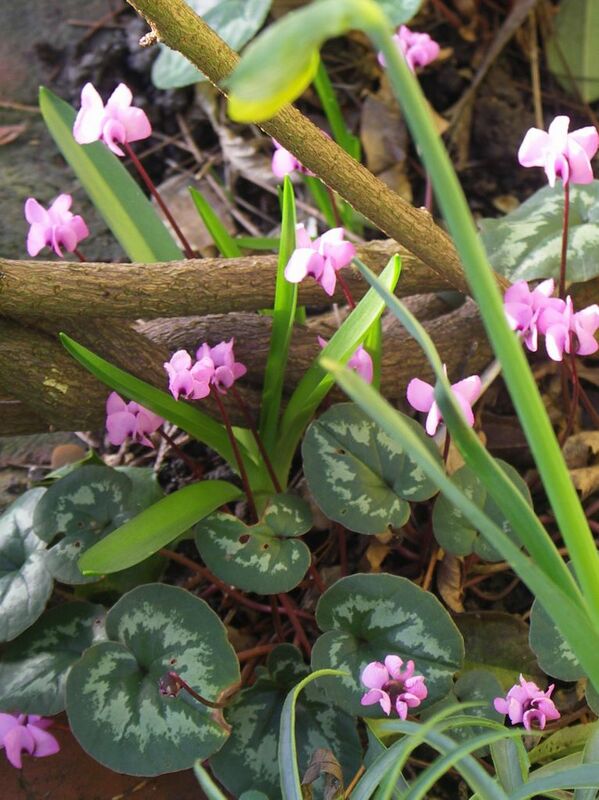 Its such an easy compact plant for slightly acid soil and dappled shade. It works well with Camellias and Acers. 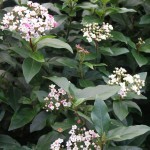 Dear little pink or white flowers arise in profusion from tubers from late winter. The leaves are dark green and rounded and often marked with a silvery pattern. 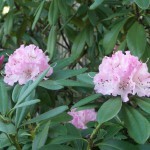 Plant them in dry shady borders or under trees. This entry was posted in Winter Flowers and tagged Camellia x williamsii 'Golden Spangles', Garden Design, Leaf & Acre, low maintenance plants, Mahonia x media 'Charity', North London, Planting Design, Rhododendron 'Christmas Cheer'; Cyclamen coum, scent, Viburnum tinus 'Eve Price', Winter flowers on November 23, 2014 by admin.